Get updates from your favorite contacts. See recent activity. Find nearby photos. Explore groups. Upload photos and video. All in one easy to use and beautifully designed app. Flickit Pro includes all the basic features you’d expect in a full-featured Flickr app. Shoot, upload and share photos & videos: Geo-tag your photos or add them to a set. View your photos by set and tag. Stay up to date: See recent photo activities from your friends and family. Search and view photos by contact. Make comments or mark them as favorites. Explore the world: Search photos & videos from the Flickr community all over the world – by subject, people, or places. Darkslide (formerly Exposure) puts Flickr in your pocket. Get access to your Photos, Photosets, Groups, Tags and Contacts in one place, share photos and use the location features of iPhone to find photos on Flickr that were taken near you. Mobile Fotos lets you browse and upload to Flickr, including finding photos taken near your current location, playing videos* and GPS location and EXIF in uploads. Reflections is the Flickr client you’ve been waiting for. Simple, elegant, a joy to use. 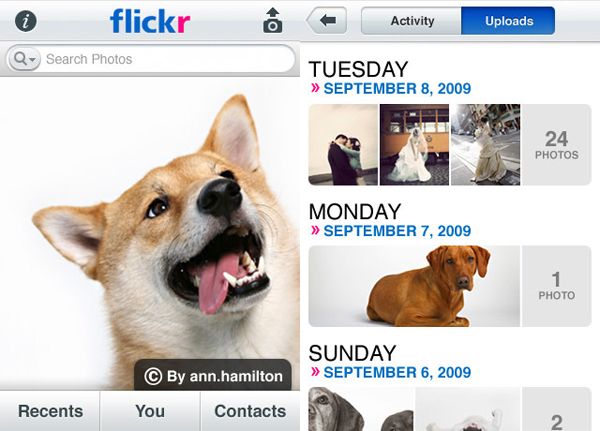 The entire Flickr universe is waiting. Explore now allows you to load the Interesting photos for any day you choose. Every day there is a new set of 500 Interesting photos, go exploring. Posted in iPhone Tagged Flickr,Yahoo!